Don’t write electrotherapy off just yet! The case for NMES. Electrotherapy as a physiotherapeutic modality seems to be on the wane. It is accused of being a passive treatment, of lacking a scientific base and there being no evidence of efficacy in the literature. With universities dropping electrotherapy from their curriculum to make way for other more current approaches to health care such as exercise qualifications and health promotion, it seems that this time electrotherapy may actually drop off the edge of the map. Now I agree wholeheartedly that exercise and health promotion activities are the most important intervention that we have in our toolkit to combat new lifestyle non-communicable diseases. But let’s not write off electrotherapy just yet! Over the past couple of years I have had the chance to review several neuromuscular electrical stimulation (NMES) units, this is the case for NMES. NMES is a non-invasive, non-addictive means of muscle rehabilitation after injury, surgery or disease. The major benefit of selectively integrating NMES in the treatment of some patients is the reduction of total rehabilitation time and concomitant reduction in the total cost of recovery. In sports medicine, NMES has been used for muscle strengthening, maintenance of muscle mass and strength during prolonged periods of immobilisation, selective muscle retraining, and the control of exercise related fatigue, soreness and oedema. 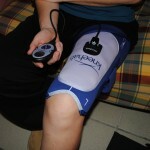 The Kneehab XP from Neurotech is specifically designed to treat quadriceps atrophy. It can simply be described as a piece of neoprene with integrated electrodes that you wrap your thigh and secure in place with velcro fastenings. It features just one program, there are no cables to worry about and conductive gel pad positioning is applied through the positioning of the neoprene ‘wrap’. Kneehab is very easy to apply and use. You get a good quadriceps contraction although it does not feel as specific as it could be. With no cables it can easily integrated into a rehabilitation program. I would recommend this device for people who need a simple solution to supplement prescribed quadriceps rehabilitation exercises. The CefarCompex mi-theta 600 is a whole different ball game! Firstly you have to be able to locate your own motor points to apply the electrodes (not always easy when this isn’t described in the handbook!). Then you need to choose from the 134 rehabilitation programs available or customise the parameters to create and personalise your own program. Although complex and technical this device creates very specific responses that can be adapted to the specific rehabilitation needs of the client. This is the unit that will condition muscles when injuries don’t allow full independent rehabilitation; you can program for atrophy, strength or endurance; it allows co-contractions of agonists and antagonists and after all that it addresses exercise induced fatigue responses. It is undoubtedly the master of all NMES units! It does however have the issue of the cables, they get everywhere, get in the way and make it difficult to perform more dynamic exercises!! The Wireless Pro is the new kid on the block from CefarCompex. This is a toned down version of the mi-Theta 600 without the cables. It gives total freedom of movement facilitating patient treatment and allowing you to easily combine active exercise with electro stimulation for a better result. Compared to the theta 600 the Wireless Pro does not have as many programs to choose from making it more user friendly and less complicated. However, some programs are noticeably absent which some clinicians will miss. But the best thing about this unit is the lack of cables, I used it for dynamic exercises, cycling and even x-country skiing. We also trialled it with some patients at the clinic. 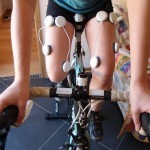 The highlights being that you can combine dynamic exercise with muscle stimulation and provide hands on feedback/manual therapy techniques all at the same time. Given the addition of a few more programs and a reduction in the size of the electrodes this machine is the perfect compliment to any rehabilitation program! I agree that the use of many electrotherapy modalities is outdated and not cost effective. However, we shouldn’t therefore write off this entire part of our physiotherapy history! Where there is evidence for use (both literally and/or clinically) and the modality is used effectively (this is a big problem with the use of electrotherapy modalities) there may well be a case for it’s use. When used effectively electrotherapeutic modalities are a good thing to have in our toolkit to make what we do even more effective and a great adjunct to selectively chosen treatment plans. The difficulty lies in confirming what modality is effective for what condition and at which parameters? There’s a big PhD in that for someone! 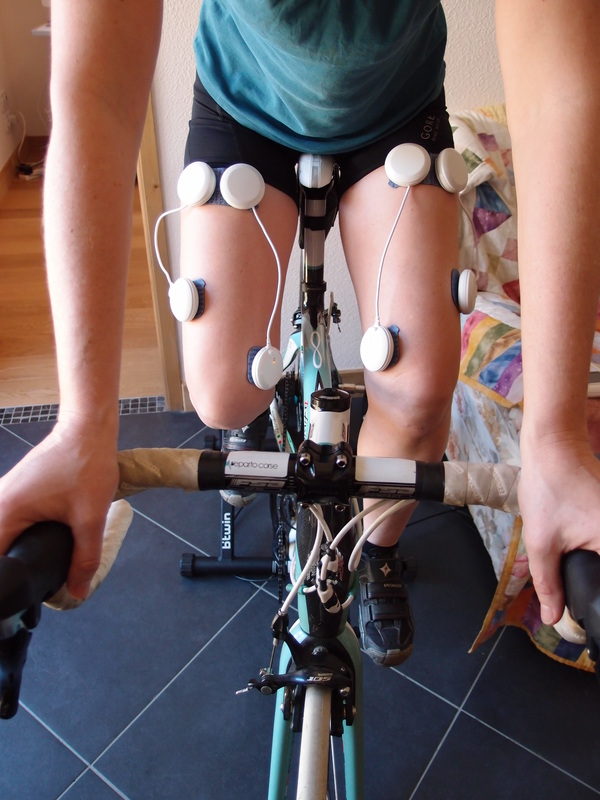 Vaz MA, Baroni BM, Geremia JM, Lanferdini FJ, Mayer A, Arampatzis A, Herzog W. Neuromuscular electrical stimulation (NMES) reduces structural and functional losses of quadriceps muscle and improves health status in patients with knee osteoarthritis. J Orthop Res. 2013 Apr;31(4):511-6. Elboim-Gabyzon M, Rozen N, Laufer Y. Does neuromuscular electrical stimulation enhance the effectiveness of an exercise programme in subjects with knee osteoarthritis? A randomized controlled trial. Clin Rehabil. 2013 Mar;27(3):246-57. Boyaci A, Topuz O, Alkan H, Ozgen M, Sarsan A, Yildiz N, Ardic F. Comparison of the effectiveness of active and passive neuromuscular electrical stimulation of hemiplegic upper extremities: a randomized controlled trial. Int J Rehabil Res. 2013 Dec;36(4):315-22. Kushner DS, Peters K, Eroglu ST, Perless-Carroll M, Johnson-Greene D. Neuromuscular electrical stimulation efficacy in acute stroke feeding tube-dependent dysphagia during inpatient rehabilitation. Am J Phys Med Rehabil. 2013 Jun;92(6):486-95. Nascimento LR, Michaelsen SM, Ada L, Polese JC, Teixeira-Salmela LF. Cyclical electrical stimulation increases strength and improves activity after stroke: a systematic review. J Physiother. 2014 Mar;60(1):22-30.